The world is moving into a new era, and now more than ever the clans work for the progress and the evolution of their community. Everyone tries to find new ways to improve their lives. New means to grow their lands and new constructions that create an easier life. 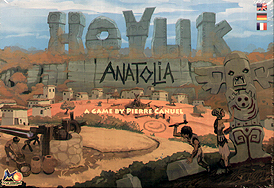 In Hoyuk: Anatolia, you must prove your quality through three different achievements: build a water supply system for your village so the water can reach your land, throw the best fest in the valley, and finally, build two artifacts!